Our IRLP node 6549 operating on the WaiPlenty 2m repeater network, serves roughly the area depicted below. This map shows the approximate boundaries of coverage for a 25W mobile using a roof-mounted 3dBi antenna. 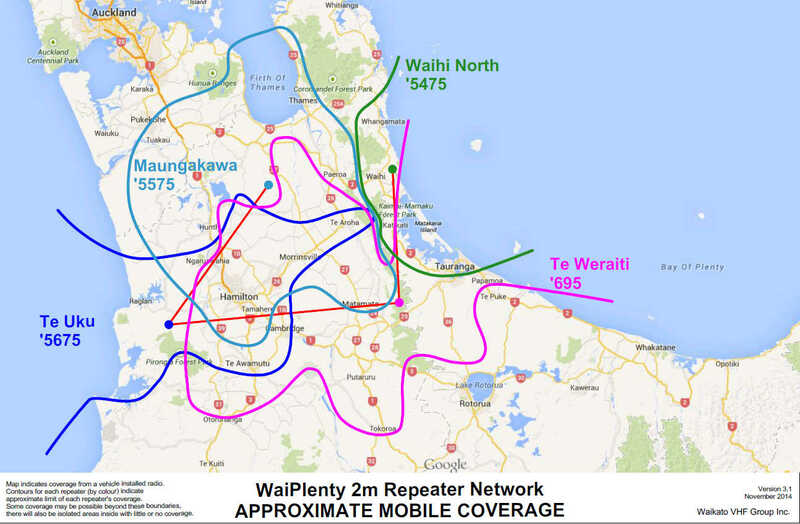 Details of the WaiPlenty 2m repeater network and access frequencies. Whangamata and Katikati is Waihi North '5475, and for North Waikato, Thames Valley/Hauraki Plans and Thames Coast is Maungakawa '5575. The IRLP node 6549 is available for all Amateur radio operators to use, but we do request that you announce yourself and your intention to use the node, before making a connection. It is also important to listen briefly (15 secs.) before making your intentions known. When using the node, always leave 3 secs between overs, to allow the remote node to unkey, any timeouts to reset on the remote repeater and to allow other operators to call in. The status of New Zealand nodes can be checked here before making a call. "IRLP Guidelines" can be found here. The "IRLP Status Page" can be found here. For those interested in checking out the IRLP network on Google Earth can click this link - http://www.irlp.net/setup-irlp.kml - it will download a "networked linked" kmz file from the server which will update every 2 minutes, complete with all the info for all the links and nodes. When closing Google Earth, when prompted, save the changes. That way all you will have to do is open up Google Earth, and all IRLP connections will be displayed. Yellow lines are node to node while blue are reflector connections. Also for those interested, the LIVE status of IRLP Reflectors can be seen HERE. 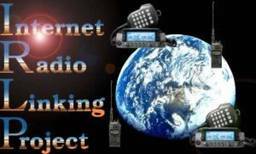 See what Wikipedia has to say on the Internet Radio Linking Project (IRLP). To connect to a Node Dial the 4 digit Node No. All IRLP nodes in New Zealand can be found HERE. For those interested in using IRLP, the main piece of equipment that you will require is a 2m transceiver with a DTMF keypad. However, if you do not have DTMF on your transceiver, all is not lost. The repeater can be monitored as usual and if somebody comes up via the IRLP node, you can have a QSO with them. It is also possible to feed DTMF tones into your microphone from an external audio source. The WaiPlenty 2m repeater network can still be used as normal, as the IRLP system does not affect its normal operation. If the WaiPlenty 2m repeater network is required for an AREC exercise or civil emergency, the IRLP node will be disconnected. It will also be disconnected if any problems occur. Therefore, if you get no response from the 'Special Codes' mentioned above, you can assume that the node has been disconnected or may even be faulty.